Christian Hardy, from Riverview, Florida, is a senior at the University of Kansas studying journalism and history. He’s interned for the Kansas City Star via the Sports Journalism Institute and the Wichita Eagle. With KU’s student paper, the University Daily Kansan, he’s worked as the editor-in-chief, managing editor, sports editor, associate arts and culture editor, and web editor. He also works for student-operated radio station 90.7 KJHK, and hosts a weekly podcast called Interested. He’s the son of John and Brandy, and has three siblings – Juliana, Adilynn and Easton. 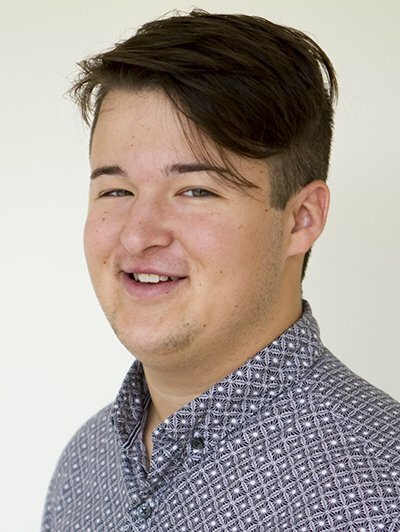 Christian is the fifth Murray Scholar from the fifth Murray Scholar from the William Allen White School of Journalism & Mass Communications at The University of Kansas. Christian found a fantastic subject for his essay and did an outstanding job of researching and capturing a small portion of John McLendon Jr.’s life. We cannot thank the Jim Murray Memorial Foundation enough for its terrific support of so many students. Athletics Director Phog Allen could not allow John McLendon Jr. to swim in the Robinson Gymnasium pool. He believed blacks swimming with whites was too dangerous. When McLendon took his first swim during his senior year in 1936, University of Kansas officials drained the pool. He wasn’t deterred. He planned to swim often, warning pool keepers of more work and high water bills to come. McLendon saw signs posted on the KU campus: “Don’t swim with the n–.” He immediately ripped them down. But a swimming class was required for McLendon to earn his physical education degree. Before 1933, when a swimming credit was a requirement for all students, African Americans were given their grade without entering the pool. The rule waived the credit to maintain segregation. As KU’s first black physical education major, McLendon wouldn’t accept the free pass. He drove 40 miles west from Kansas City, Kansas, to Lawrence to earn his degree and become a basketball coach. He wasn’t going to cut corners. His father had ingrained a simple message prior to delivering him to James Naismith in 1933. From lessons he learned from watching a single blacktop game with Naismith, McLendon reinvented basketball. He became a Hall of Fame coach, and the father of the fast break and full-court press. By the time McLendon arrived on campus, basketball’s 72-year-old inventor was a professor emeritus. Nonetheless, Naismith’s intolerance of racism made it easy to advocate for McLendon. Secretly, McLendon gathered the 60-some African-American KU students and told them to avoid the pool for the next two weeks. The two weeks passed without incident, opening the pool to blacks at designated times. To ensure their safety, Naismith assigned football players to keep watch. McLendon played basketball at Kansas City Kansas Junior College before coming to Kansas, but he was still filled with doubt and fear when he arrived at KU. Nevertheless, his father assured him that he was entitled to a place at the University – he was a taxpayer, after all – and Naismith, assigned to be his adviser, would care for him. In an interview, Katz explained how the senior McLendon “assigned” Naismith to be his son’s adviser. What started as a friendship between McLendon and Naismith became a basketball mentorship. Segregation barred McLendon from playing basketball at Kansas — although he did try out for the team — so he was intent on coaching it. For Naismith, 40 years had passed since he invented the game. His relevance and voice in the basketball community had waned. Still, Naismith carried the same ideals about the sport he created – it was supposed to develop character and improve lives. McLendon was more than enthralled. He thought the frenzied style could be harnessed into what eventually became the fast break and the full-court press. In 1979, McLendon was inducted as a contributor into the Basketball Hall of Fame, named after his friend and mentor. In 2016, McLendon was inducted into the Naismith Basketball Hall of Fame for a second time, but as a coach. He was the first college coach to win three consecutive national championships (Tennessee State, 1957-59); the first black coach to integrate a professional team (American Basketball League, 1961); and the first black coach in the American Basketball Association (1969). Naismith died in 1939 and was buried in Lawrence Memorial Park. McLendon died in 1999 at the age of 84. In 1994, a nine-foot tall statue was erected in the park in memorium to Naismith. In front the statue are eight benches, all of them etched and laid out into a semi-circle. Four are biographical to Naismith, one about his values, another lists KU coaches. Two are dedicated to individuals.